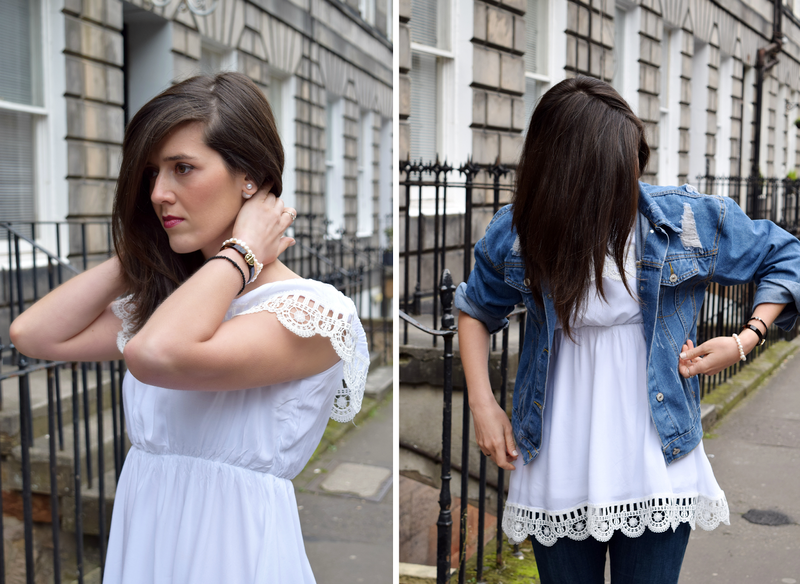 When getting dressed for an autumnal day, white lace dress is definitely not what you have in mind. However, it was sunny and warm the other day in Edinburgh so I gave it a go. The loose fit denim jacket is something that was missing from my closet and I was searching for one other than the typical Wrangler for a long time; this is a pretty awesome alternative, as it scores with half price! Denim on denim is a great choice when in a rush (aka Steven wants to get out and I cannot sacrifice more than 20′ to get ready)-so I played it safe. I am sorting out draft posts tonight as I am busy this week but I want to fill you all about my plans. On an irrelevant note, does anyone know how to import SD camera pics to an iPhone? Google is not my friend today… (thanks in advance for any answers).